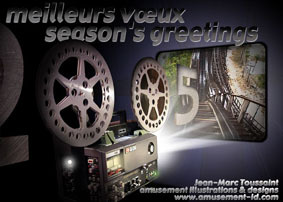 8mm Forum: Happy New Year to all! » 8mm Forum » General Yak » Happy New Year to all! Author Topic: Happy New Year to all! Same to you Trevor and everyone else!! Happy 2005 to you all! Bigger version of my Greeting card here . Happy now year to this WONDERFUL super 8 community! Happy new year to the World super 8 community!